Important! While the other three assessments are sold individually, the Learning Mode Assessment is only available in this book. Distinctive Element: Self Leadership is based on an important, longstanding mandate for all leaders to “know thyself.” We created each profile in this track to help students better understand and lead themselves. They discover who they are in Christ and then find their best fit in ministry. 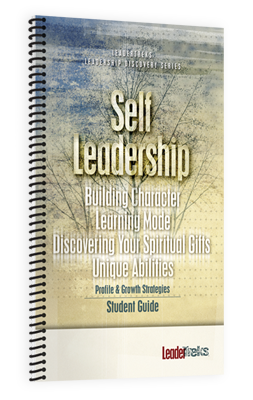 The Self Leadership track is an effective blend of four distinctive tools designed to help students identify their strengths and think objectively about their unique value to God’s Kingdom and their ministry team. This process of self leadership will create momentum for life change in your students. Gain a deeper understanding of how God has wired them. Create opportunities for students to examine their spiritual life and develop a plan for growth. Grow in confidence in their personal skills and leadership ability. Discover their best fit in ministry and learn how to lead within that role. Building Character – How can I develop my character? The foundation for effective leadership is godly character. This assessment helps students see their character in a new light based on the fruit of the Spirit. They will also assess their readiness to change. For additional details, go to the Building Character page. Learning Mode – What’s the best way for me to learn? This assessment helps students discover how they learn and process information. Are they visual, auditory or kinesthetic learners, or some combination of the three? This valuable tool will help you evaluate whether or not your program is reaching students in their optimal learning mode. Discovering Your Spiritual Gifts – What are my spiritual gifts? We designed questions especially for students to help them uncover their giftedness. Students will understand how to use their gifts as leadership tools and how their gifts function in a team environment in order to reach their peak performance. For additional details, go to the Discovering Your Spiritual Gifts page. Unique Abilities – What am I really good at? Students discover more about their talents and strengths. This tool coaches students through an introspective process to help them identify their unique abilities. For additional information, go to the Unique Abilities page.